PHP Extensions and Applications Package is a software which is developed with the PHP programming language. cPanel allows you to easily search for the PHP Pear packages. You can also view all the available PHP Pear Packages. 1. 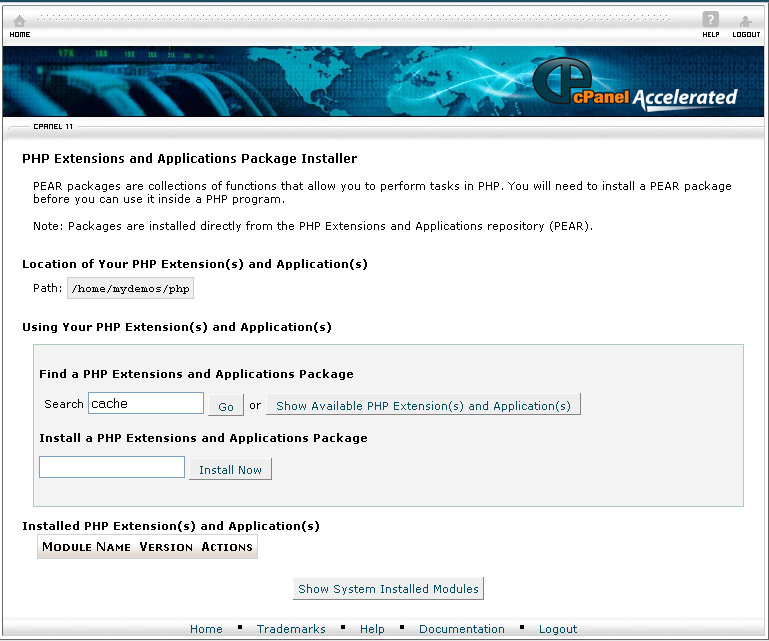 On the homepage of your cPanel, click on PHP Pear Packages under Software / Services. 2. Click on the Show Available PHP Extension (s) and Application (s) button. 3. When you find the PHP Pear Package, click on the Install button. It will take some time to install the package. 2. Type in the name of the module you want to install in the search box. 3. When you are done, click on the Go button. 4. When you see the PHP Pear Package module you want to install, click on the Install button. 5. To view the documentation for the particular module, click on the Show Docs button. The Perl Module is successfully installed. The Installed Perl Module (s) table allows you to manage the Perl Modules you have installed. 1. If you want to update a PHP Pear Package to a newer version, click on the Update button. 2. If you want to reinstall a PHP Pear Package, click on the Reinstall button. 3. If you want to uninstall a PHP Pear Package, click on the Uninstall button. 4. If you want to view the documentation for the PHP Pear Package, click on the Show Docs button. There are a number of PHP Pear Package that are initially installed in cPanel. You can see a list of these PEAR softwares by clicking on the Show System Installed Modules button. The PHP Pear Package modules which are preinstalled cannot be deleted. By following the guidelines above, you will be able to install PHP Pear Package software through cPanel.